Hudson offered a wide range of options for its Model 1C (jet) and Model 2C (Super jet) including four different axle ratios, two wheel widths and seven tire selections. Lots of color choices made jet paint and trim selection a real showroom challenge. There were four basic shades, then Super jet buyers could choose from four additional "special gem-lustre colors." For an average of $30 extra, these could be parlayed into a choice of 19 two-tone varieties. Love those old shade names-how about a combination of Robin's-Egg and Blue-Grass greens? A trip through the rest of the 1953 option list, with a blank check, could easily add up to big money. Performance buffs could specify the aluminum 8:1 compression cylinder head ($13.75), Twin H-Power ($85.60) and combination fuel and vacuum pump ($11.11)-backed by stick with overdrive ($102.46) or HydraMatic ($178.03). Then, picking selectively, oil bath air cleaners, an oil filter, an electric clock, deluxe eight-tube radio, tinted glass, "Weather Control" heater and custom wheel discs left shoppers very little change from $300-and if you specified hand-buffed, genuine leather upholstery at $136.57, you practically had a miniature Buick! In 1954, the Jet Liner had even more options. To make your Jet a junior Hornet, you chose from a list even longer than the '53s-and now it included Hornet wheel covers, steering wheel, continental kit and even a Hudson-ized set of Kelsey-Hayes wire wheels. The wires cost $270 and must have been a rare option, indeed. 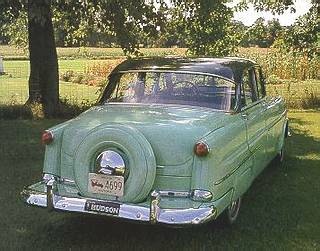 Hudson called the Jet-Liner, "The most luxurious car in the lowest price field. Owners who specified Plasti-Hide upholstery and trim (a version of Naugahyde) sat on reinforced, foam-rubber seats surveying the road from behind Hudson Teleflash signals on an instrument panel color-keyed to their jet's interior. As the showroom brochure said, "Behind the wheel of a Jet Liner, you're in for luxurious driving!" On the utilitarian side, Jets could be fitted for police and taxi work. A special price list offered a heavy duty clutch for $3.75, a beefed-up generator and battery ($45.48) and heavy-duty shocks ($5.35). Finally, for those long hours on stakeout, or sitting at the taxi stand, beefy operatives could specify stiffer front seat springs by paying only $2.14. 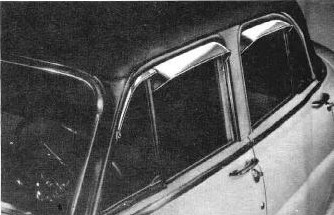 For extra comfort and that "big-car look," sparking, lower-priced HUDSON WINDOW VENTSHADES were offered to customers. For Jets, Wasps, and Hornets - Window Ventshades and Rain Shields were made of polished stainless steel for lasting beauty. They fit perfectly - were rigid and rattle-proff - and could easily be installed in less than ten minutes without using any tools! They add extra width for bigger-car appearance. Provide open-window ventilation in rain. Shade interiors from sun, heat, and glare. 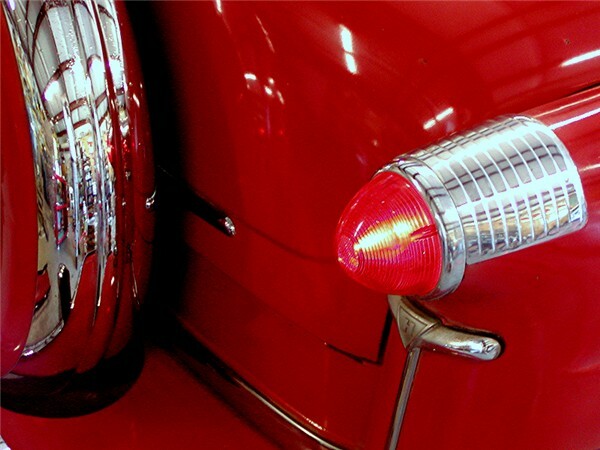 Add to the modern appearance of the car! Did you know that Ventshades were available as an option? Exhaust Pipe Deflectors were an aftermarket accessory. Continental Kits add a touch of class and free up room in the trunk. 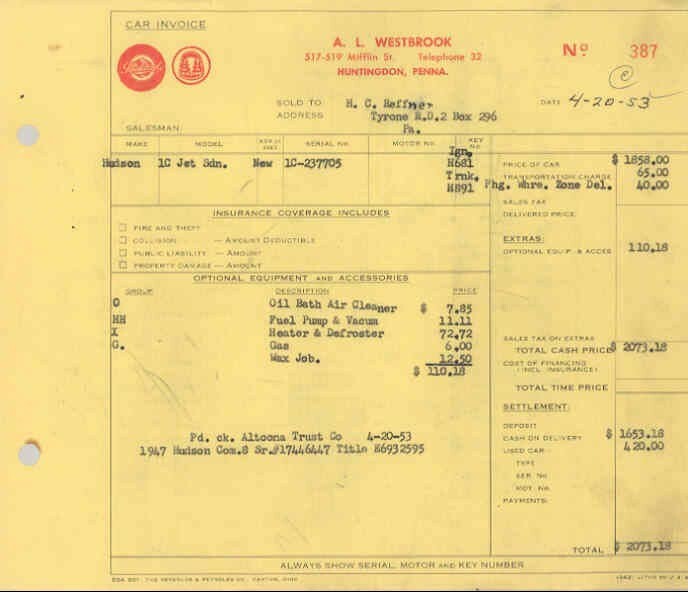 Here's an actual invoice dated April 20, 1953. Note the Option Code, Description, and Price. Do you see that this person was trading in a 1947 Hudson Commodore 8 for this Jet?